Memorial Day always winds up the annual observation of Asian Pacific American Heritage Month. And what better way to remember the one story (along with the Japanese American Internment) that lingers as the moral compass of the community. 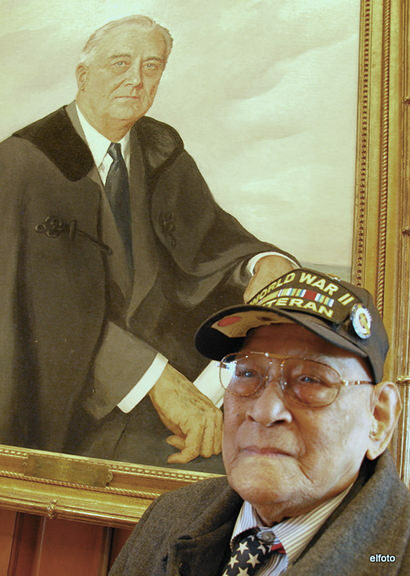 For that reason, this Memorial Day will be a special one for Filipino WWII Veteran Celestino Almeda. Despite many vets seeing an equity pay windfall in 2009, a handful like Almeda are still in appeals. His fight for justice with the U.S. government has been the bureaucratic version of the Bataan Death March. That’s no disrespect to the survivors of that historic event 75 years ago. Almeda certainly will remember deceased friends like retired U.S. Air Force Major Jesse Baltazar, a former POW who survived the Bataan Death March in 1942, and died just last year at age 96. Baltazar often accompanied Almeda, fighting side by side in the latter’s bureaucratic battle with the VA over equity pay. 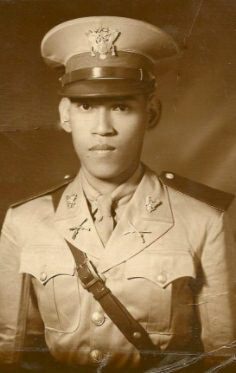 Almeda was a young soldier in the Philippine Army reserve, when he answered the call of U.S. President Franklin D. Roosevelt to protect the Philippines with the U.S. Armed Forces of the Far East. The added lure was full benefits as a soldier, including U.S. citizenship. As you’ll hear in my interview with him on Emil Amok’s Takeout, Almeda, the reservist, was made active for a year. He was then made inactive when Gen. MacArthur retreated to Australia as the Japanese took over Manila. Almeda has official Philippine Army documents signed by U.S. officers to document all that. What he doesn’t have is the record that he served in the guerrilla forces, which Almeda says were only verbal orders. Once the war was over, he was made active again and served side-by-side Americans. There would be no problem until President Truman signed the Rescission Act of 1946. which stripped the Filipino veterans of any right to the benefits that had been promised for their service. Ever since then–for more than 70 years–Filipinos like Almeda have been fighting piecemeal for a restoral of all the benefits due them. Almeda’s service has been good enough to help get him U.S. citizenship in 1990. He’s even been given a VA card for medical benefits. 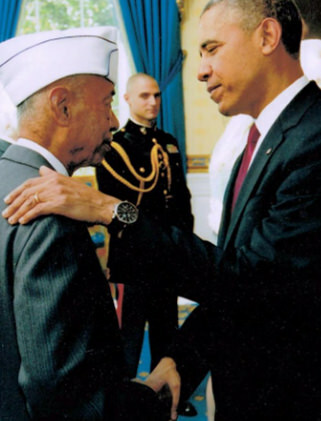 But it wasn’t until President Obama in 2009 finally came through with a lump sum payment of $15,000 to Filipino veterans living in the U.S., and $9,000 for those still in the Philippines, that Almeda found himself in the bureaucratic battle of his life. The VA has approved more than nearly 19,000 cases, according to its website. The payout has been more than $220 million. But it’s also rejected close to 24,000 cases. There’s about $56 million left in the pot. But that doesn’t mean the VA is willingly giving it out, at least not to Almeda. The VA wouldn’t honor his Philippine Army documents, though he has kept the originals in pristine condition. He’s still currently in appeal, but in the meantime, he’s taken to public protests like one last year when Robert McDonald, the VA Secretary under Obama appeared in public. In the Q&A part of the program, Almeda tried to appeal to McDonald but had his mic turned off. MacDonald’s reaction got a stern rebuke from retired General Antonio Taguba, the general who led the investigation into Abu Ghraib. Taguba additionally pointed out that updates to the law–PL 111-5, American Recovery and Reinvestment Act (Filipino Veterans Equity Compensation)–directed the Secretary of VA to consider all forms of evidence of service and not just those originally considered. “This amendment has not been fully executed by the VA,” Taguba complained to Mc Donald. Now a year later, McDonald’s out, a new VA head is in, and Almeda is still fighting for justice, seemingly locked in the Bataan Death March of appeals, hoping to get approved for his lump sum before he turns 100. It’s Memorial Day, but his taste for justice has not died. Listen to him tell his story on Emil Amok’s Takeout. Days before his 100th birthday, Almeda’s still got a lot of fight left. On my recent trip to Washington, DC, I was able to talk to an old friend, Theo Gonzalves of the University of Maryland Baltimore County, and the president-elect of the Association for Asian American Studies. What are they doing? How has Asian American Studies stayed relevant? How valuable is the AAS degree? Use the fast forward and listen to Gonzalves, where he thinks Asian American Studies is going, and the importance of APAHM. All that and my comments on the news, including martial law in the Philippines, and the Warriors/Cavs NBA Final on Emil Amok’s Takeout. 6:25 Martial Law in the Philippines? Oh, just “Partial Martial”? 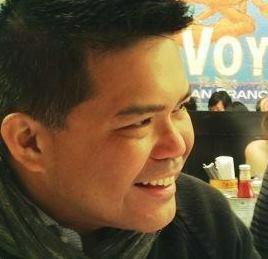 42:28 Intro and interview with Association of Asian American Studies President-elect Theo Gonzalves, University of Maryland, Baltimore County.